I can't believe Miriam is nine months old already. She did great with the stage one baby food, so we've moved up to stage two. We're continuing to make and feed her foods that we want her to learn to eat as she gets older- particularly vegetables from our garden. I want to share with you a couple of the recipes (and I use the term recipes very loosely) that I've used for this step up. 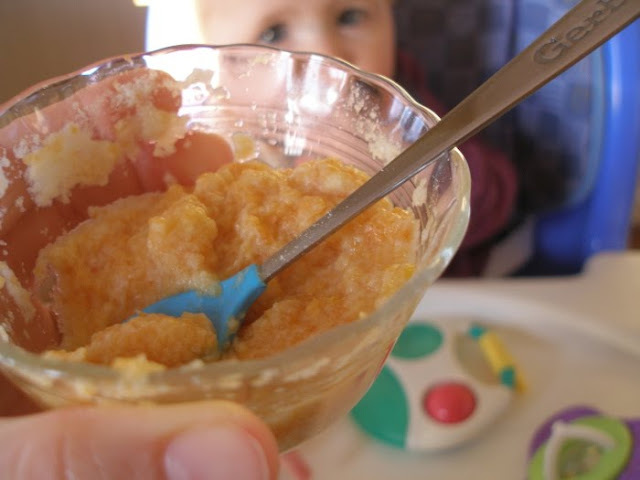 My ideas stemmed from Top Baby Food Purees by Annabel Karmel. Miss. Miriam waiting for her next bite. In all honesty, it's a rare occasion that I get to feed Miriam anymore. Sam and Sadie take turns under close supervision. She eats better for them than she does for Jamey and I. The first one I'll show you couldn't be simpler. Potatoes, carrots and baby rice cereal. And a pat of butter (to help the beta carotene absorb more easily). 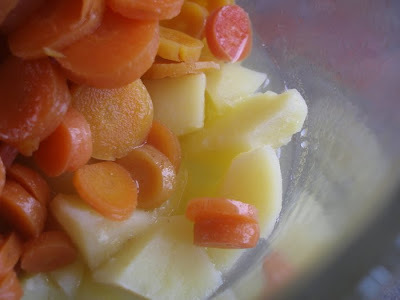 Boil the potatoes and carrots, add butter and cereal and blend with a blender (hand-held, immersion blenders work great for this). The second 'recipe' is chicken, butternut squash, apples and baby rice cereal. Yum. Same, simple deal. Boil/cook chicken. Bake or boil squash and apples. Put them all in a bowl and blend. That's it. 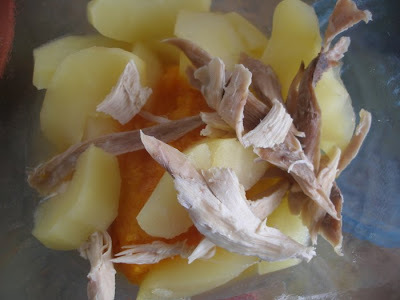 A couple other combinations have been corn/carrot/sweet potato, chicken/butternut squash/pea and apple/peach. I also made a cooked brown rice, sweet potato and pea blend. My little pumpkin loves them all. 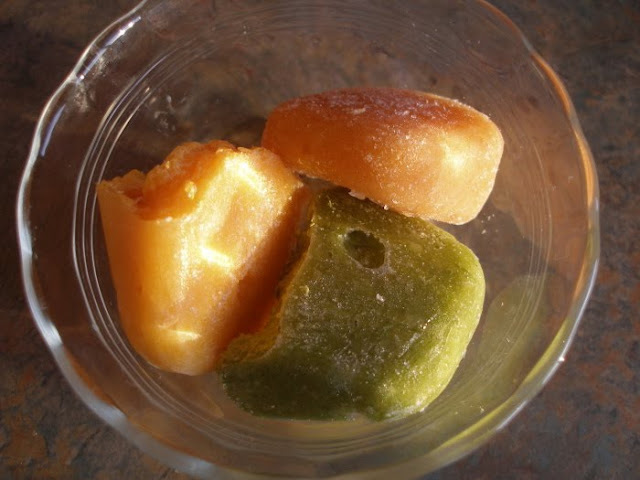 They are frozen in ice cube trays, then popped out into freezer bags for easy storage and use. We're doing two meals of baby food a day (lunch and supper) since she is still nursing so much. I find it helpful to have a book to look to for ideas and reminders. It's not necessary, but little nuggets of information (like which fruits can upset young babies' stomachs, etc.) help refresh my memory and avoid upset tummies. The turkey & vegetables looks so good I want to eat it! I think it's sweet the older want to feed the younger. The first picture with Miriam in the background is absolutely darling. Looks Wonderful!! 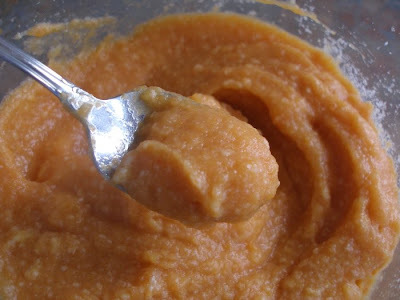 I plan to make all the baby food for our newest little one once he gets here and reaches the solid food stage. I LOVE the ice tray idea I do believe I will use that one. Thanks! One question though. You said to use a blender. Would a food processor work as well? BTW.. I love your blog it is so helpful and interesting even my husband enjoys reading many of your articles. 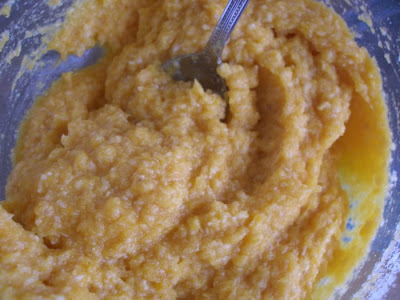 I think a food processor would work very well for stage three and possibly stage two, but I'm not sure it would really puree the stage one food smooth enough. You could certainly try it and process the dickens out of it to see if you can get it smooth enough. If you're afraid it won't, hand (immersion) blenders can be bought for $30 and are well worth the investment- they're not just for baby food. Blessings to you on the arrival of your baby! According to pediatricians stage one and two are the same consistency. Stage two is just a bigger serving /portion. I use a food processor and have had no problems with consistency. Love your recipes on here! Can't wait to try!! THHP - just curious how you reheat the frozen cubes. I'm assuming you let it thaw first, but then do you serve in room temp or heat it. Just asking because someday I hope to be a GRANDMA!! Amy, When I think of it, I let them thaw. When I don't, I microwave the cubes until they're warm, making sure that it's stirred really well and testing it before feeding it to Miriam (to avoid her getting any hot spots). The fruit I started serving warm and now I serve room temperature. Rachel, I used a food processor for stage one...it didn't get it completely smooth (I only have a small one) but my baby ate it fine. In fact, I didn't puree much for her...I would chop things up with a knife sometimes, or feed her oatmeal or whatever that had textures. Is it super necessary to get it completely smooth? If so, I'd love to know because my second one will be starting in about 4 months! Thy Hand, as always another lovely post. 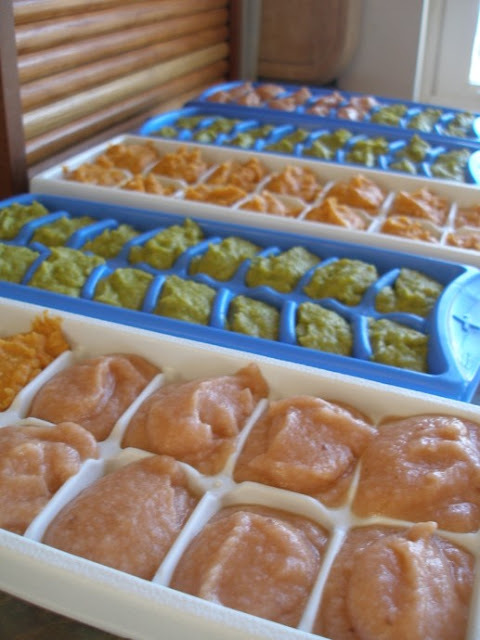 I think this time around I will use the ice cube trays. With my first one I just made little batches of whatever it was we were eating and it was kind of a pain. And a question, is the butter okay for babies under a year old since you aren't supposed to feed them dairy yet? Maybe that whole thing is old information. I know with my first one they (drs, etc) said to keep the dairy, honey, wheat, and peanut butter away for allergy reasons. Oh wow, I can't believe I'm soon going to be making baby food again! It seems like I just did that yesterday! If your babe had no trouble with the food you made with your food processor, I would think it would be fine to do it again as long as the baby is watched carefully to make sure they can gum the little chunks (which I have no doubt you did:-)). The baby food book I mentioned above suggested adding the butter. The author also suggests using whole milk in some of their stage three foods, saying that it's safe to use before age one IF COOKED- the recipes call for cooking the milk (in a cheese sauce, for example). If you want to be extra safe or if a dairy allergy runs in the family, by all means, leave it out. If I haven't said so as of yet, congratulations on your new addition!! And I can't believe Miriam is 9 months already either!! Wow...time is going SO fast. Thanks much! I'll be quite happy if I can give the baby a bit of dairy. It feels funny not giving them at least a little, seeing as how it is good for us and we can have all the free milk we want (we're dairy farmers). Since our milk is raw, I will definitely cook it. I don't know that anyone is allergic to milk in my family so I'm going to use it! Oh my soul...my mother found you blog the other day.. and I am tickled to pieces.. I am always trying to find ways to feed my family better and make my husbands paycheck stretch for our family of 9. We have 11 1/2 month old twins and they eat ALOT. Right now I am purchasing $126 worth of jared baby food a month! YIKES!! This is not budget friendly and I am sure I can feed them better than this. I am getting the book ASAP!! Thanks so much.